The Thought Express: The Black Dog Easy Evening - An Experience to Remember!! The Black Dog Easy Evening - An Experience to Remember!! As a marketing professional, I have always been intrigued by Surrogate Advertising. I find it very challenging to think up of marketing techniques to employ in order to push brands where ATL Advertising is not legally allowed like in the case of Alcohol and Tobacco products. So much so that my thesis in MBA was also focused on Surrogate Advertising. Thus, it was almost too good to be true when I got an invite for a Black Dog Easy Evenings Experience. An evening that combined gourmet food, alcohol and music, the stuff that dreams are made of (they had me at food anyways!). 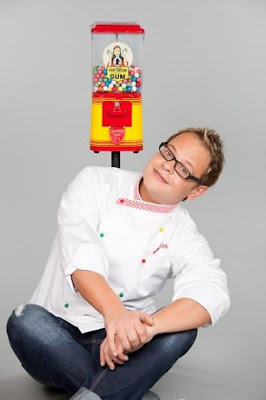 The menu had been designed and executed by the Italian Masterchef winner 2011, Spyros Theodoridis. In true Masterchef style, Spyros had created 5 courses, each paired with a different year of whiskey from the Black Dog repertoire. Dressed in my long forgotten black and white strapless dress and even more long forgotten black heels, I set out to have the time of my life. And have the time of my life I did. The venue was the Westin Hotel in Gurgaon, a classy property. What was interesting to me was the fact that the promotional material was co-branded with Westin which probably meant that they were partners in the event rather than just being a venue (and thus rationalising the cost further - brilliant). 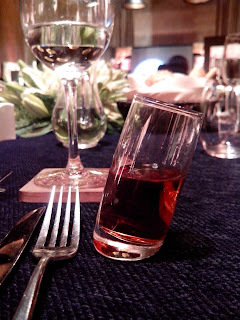 Surrounded by a mix of air-kissing socialites and corporate big-wigs, we got our drinks and had a canape or 2 to get our taste buds rolling. Being a 'Black Dog' event, the bartender was not too impressed by my question on what he had besides whiskey and wine, for I truly despise both. But he was sporting enough to mix me a Mojito (or 2 :)) which I flaunted to envious eyes wondering why I was the only one in the event with a cocktail! The crowd then moved on towards the banquet hall which was laid out for a formal sit down dinner. Each table was set for 6 people and as we took our places at one, we were joined by 4 very interesting dining companions. I felt like something out of Pretty Woman when I saw the cutlery laid out in front of me- 4 forks, no less besides a couple of knives and a spoon. Then in a moment of inspiration, I remembered (again from a movie) that one is supposed to start with the outermost cutlery and work your way in. As the first course, the Summer Salad was served, the emcee of the evening started introducing us to the brand and what lay ahead. I daresay she seemed like she was high already, the amount of faux pas she made. 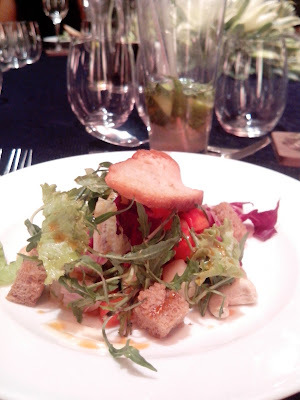 The salad itself was light and refreshing with citrus flavors and a melee of textures from the nuttiness of the cashew to the mushy carrots and the crunch of the fresh greens. But we were a forgiving crowd and the emcee was all but forgotten as the Master Blender for Black Dog, Richard Paterson who in his kilt personified Scotland in a way no AV could have, took centerstage. And that is when the evening started! Richard is a showman. He walked and he talked, he poured and he drank. He even threw a few glasses around! All the while, keeping the audience entertained and glued to every word. He shared the history behind whiskey and also taught us how to appreciate every sip instead of drowning it in ice and soda. 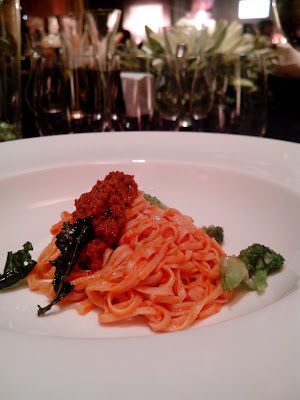 As he spoke, we were served the second course, Tagliolini with Tomato Pesto and Anchovies. I am a great fan of Pesto, albeit the basil version but I must admit that the tomato based one was equally pleasing to the taste buds. This came paired with the Black Dog 12 Years and as I swirled a sip around in my mouth, I felt each taste center come alive as Richard had promised. While we ate, a very talented musician performed for us in French, Italian and English. There never was a dull moment. Which can also be said of our table. Though we were strangers, we got along fabulously and before long we were laughing and kidding around like old friends. Spyros took to the stage now and explained how he had created the menu and how each dish was a blend of Italian tastes and Indian sensibilities. 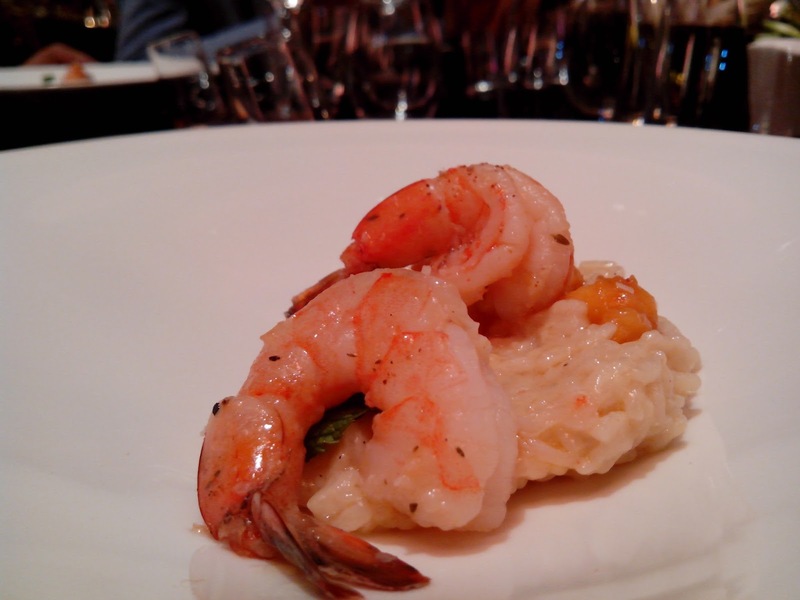 The 3rd Course, a creamy Risotto with Prawns was served thereafter, paired with the Black Dog 18 Year Whiskey. The Risotto was an interesting blend of flavors, much like the whiskey itself. With a hint of mint, small chunks of peach and flavored with licorice powder, it played a fine line between savory and sweet. But the real winners were the prawns. Succulent and cooked just right, the juicy prawns brought out the flavors of the dish even more. 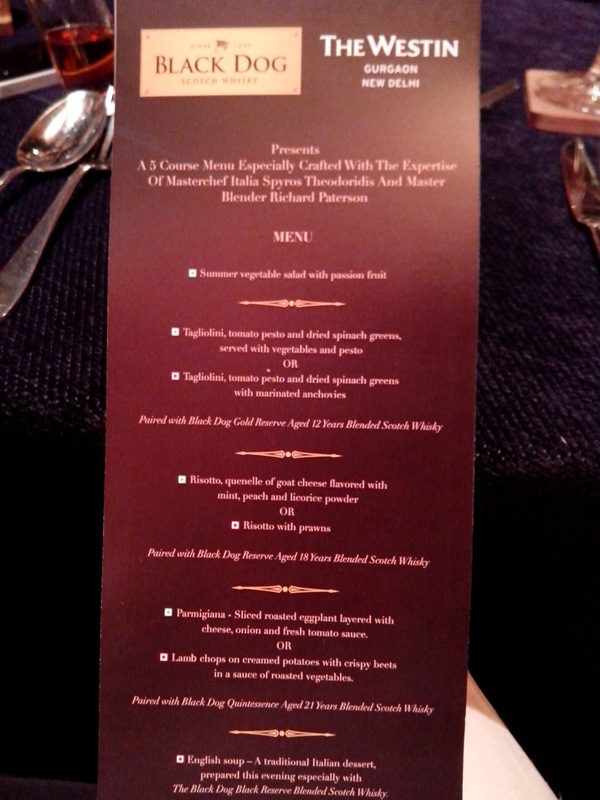 As the evening progressed, I also realised the difference between each whiskey. As we moved from the 12 years to the 18 years and 21 years, the whiskey got smoother and I could even detect slight variance in flavors. The 4th Course was perhaps our favourite course of the evening. 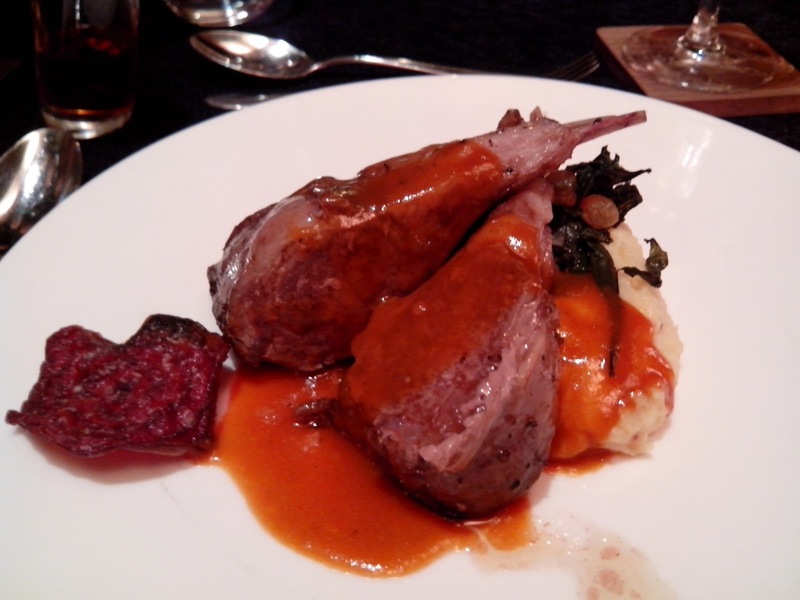 Lamb Chops served over Creamy Potatoes drizzled with a sauce of Roasted Vegetables served with Crispy Beet. In all my years of loving and appreciating food, I have never had lamb chops so succulent. So moist in the inside and giving just the right resistance to my knife, I couldn't believe that this wasn't beef I was eating but lamb. The chops were truly incredible and the only course I polished off, even though it came in fourth and my tiny tummy was already stuffed. Unfortunately I couldn't stay for the last course, as much as I would have loved to see how a soup made with whiskey could be served as desert. But a tiny tot waiting to go home and sleep and a hour's drive back took precedence and we bid adieu to our new friends and dining companions. An Easy Evening for sure, for the guests. But I could see the immaculate conceptualization and hard work that went into the backend to execute one so flawlessly. An Experience to remember, for sure. How beautifully you have expressed the whole food experience!I could almost find myself living through it So much so that the taste of succulent lamb chops has been transferred successfully into my mouth.Loved it. Thanks :) Such an amazing experience just begs to be shared! !